Make Stockholmers aware of airline company Norvvegian’s Iow fare flights to their new destination Edinburgh. 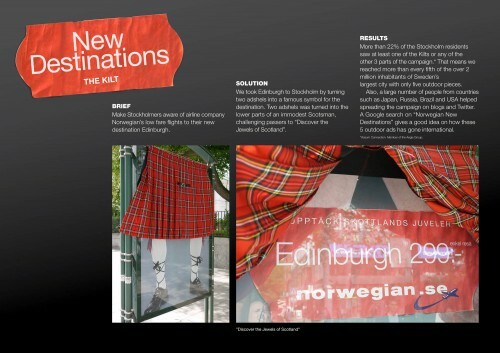 We took Edinburgh to Stockholm by turning two adshels into a famous symbol for the destination. Two adshels was turned into the Iovver pans of an immodest Scotsman, challenging bassers to “Discover the Jewels of Scotland”. Destinations” gives a good idea on how these 5 outdoor ads has gone international.